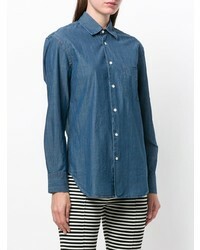 If you're after a casual yet chic ensemble, team an Aspesi denim shirt from farfetch.com with blue ripped skinny jeans. Both items are totally comfy and will look fabulous paired together. Lift up your getup with black leather pumps. If you're on the hunt for a casual yet totally stylish ensemble, pair an Aspesi denim shirt with red skinny jeans. Both garments are totally comfy and will look fabulous together. 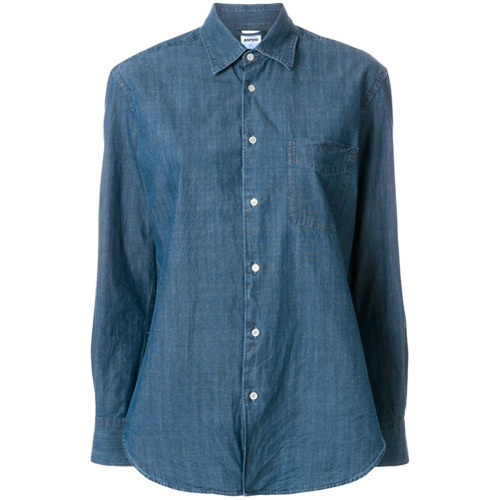 If you're after a casual yet totally chic outfit, try pairing an Aspesi denim shirt from farfetch.com with navy skinny jeans. Both items are totally comfy and will look fabulous together. Bring instant glamour to your ensemble with black suede pumps. 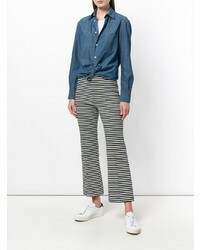 This combo of an Aspesi denim shirt from farfetch.com and white skinny jeans is effortless, totally stylish and oh-so-easy to copy! 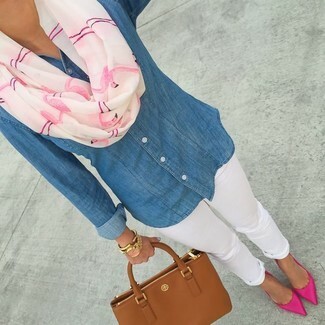 Grab a pair of hot pink suede pumps to va-va-voom your outfit. 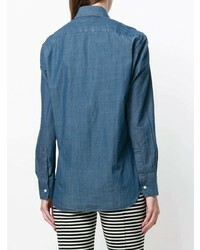 This combination of an Aspesi denim shirt from farfetch.com and blue skinny jeans is simple, chic and oh-so-easy to copy! Amp up the cool of your getup by wearing black suede pumps. If you're in search of a casual yet totally stylish getup, opt for an Aspesi denim shirt and black skinny jeans. Both garments are totally comfy and will look fabulous paired together. Break up your look with more casual footwear, like this pair of dark brown leather lace-up flat boots. If you're on the lookout for a casual yet absolutely chic look, marry an Aspesi denim shirt with a dark purple pencil skirt. Both items are totally comfy and will look fabulous paired together. Rock a pair of grey leather wedge pumps to make the look more current. If you're looking for a casual yet totally stylish look, go for a blue denim shirt and light blue ripped skinny jeans. Both items are totally comfy and will look fabulous paired together. When it comes to footwear, this outfit is round off wonderfully with black plimsolls. 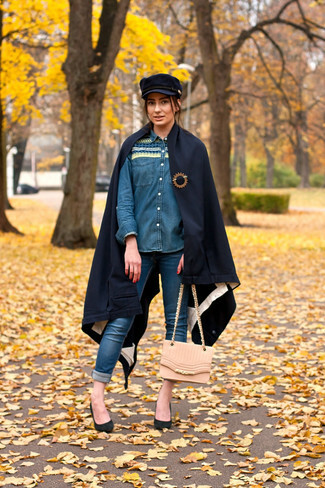 We all outfit for comfort when it comes to dressing up, and this combination of a blue denim shirt and blue ripped boyfriend jeans is a perfect example of that. Up the cool of your getup by completing it with dark green leather pumps.